The Kalkaska County Clerk vital records research area is very limited in size and staff, and as such, individuals are required to call ahead and make reservations. Only one researcher is allowed at one time, and the office is open Monday through Friday from 10:00AM until 4:00PM. Death and marriage records are listed from 1871 to the present, and divorce records are available from the past 30 to 35 years. Birth records are listed from 1871 to the present, as well, however they are not open to the public until they are 110 years old. The Kalkaska County Clerk's office is in the town of Kalkaska, MI., on 605 North Birch Street. 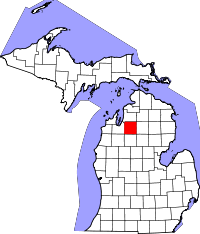 A large portion of Kalkaska County is covered by marshes, as well as the Pere Marquette State Forest, a popular outdoors destination due to the large amount of trails, rivers, and camping areas.